Modern Sunbonnet Sue's Musings | Musings from the mind of a modern day Sue. Musings from the mind of a modern day Sue. My goal this year is to finish projects. We all have them; those UFO’s hanging out in boxes and bins. Funny thing, I don’t seem to be getting anywhere too fast. How do you get from there to here, or…from here to there? My UFO’s keep multiplying. I seem to begin more projects than I finish. 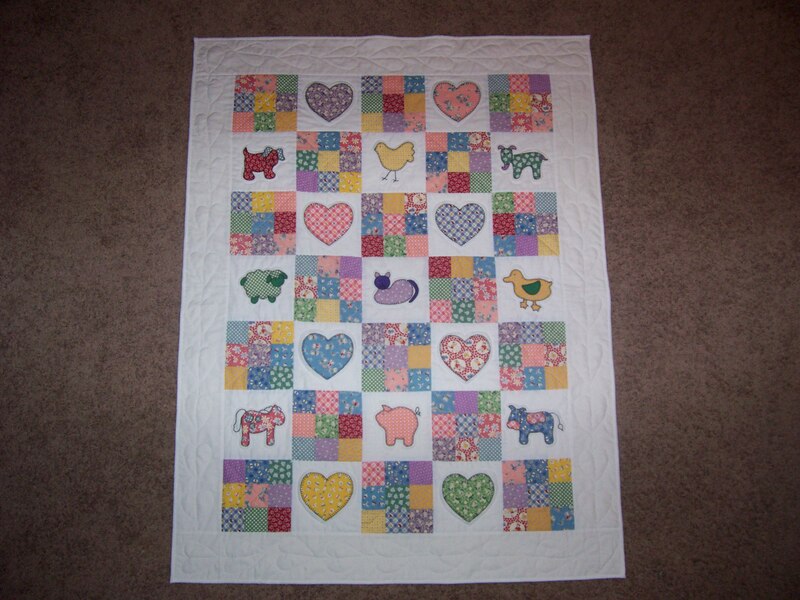 I am making slow progress on FMQ the Sew Sweet Simplicity quilt. To be honest, I haven’t done anything since my last post. Until Saturday, I hadn’t worked anymore on the applique blocks, either. Instead, I spent a great deal of time outdoors transplanting more irises and hosta plants. I prepared a new flower bed and planted seeds. The biggest culprit in not working on finishes is beginning new projects. I purchased outdoor fabric to make a new seat cover and canopy for our outdoor swing – another project I have put off doing because I already have too many. But, my husband is ready to do the sanding and painting of the frame, so he is encouraging me to do the stitching. But, before I begin, I really need to clean up the sewing space. The table has been collecting all sorts of stuff. Tables seem to be magnets for magazines, patterns, fabric scraps, spools of thread, and project boxes. With company coming on Sunday, I need to clean. So, I cut my fabric leftovers into Scraptherapy squares. I placed spools of thread on their spindles, stuffed fat quarters back into bins, and relegated magazines into a stack on the floor. There are still patterns to sort and file. I would really like to cut out the seat cover and canopy and stitch them together before our Memorial week-end barbeque. But, I got sidetracked again with one more WIP waiting to be completed. I came across a baby bib project lying under the stuff on the table. I made a bib for one of my grandsons from a foam bib shape I purchased a couple of months ago at the LQS baby event. I had a second one to make for my other infant grandson. I stitched it together this evening, adding a purchased picot edge bias tape using a decorative edge stitching. One more project completed gets me one step closer to there from here. Next week, I should have pictures of applique progress. I prepared more freezer paper shapes and basted them on a Saturday road trip. They’ll keep my hands busy at night this week. I am excited to write about my progress this week. I have actually made headway on two of my current WIPs: the Craftsy applique class project and the Sew Sweet Simplicity quilt. The star block was a quick applique, even with the sharp points. Using freezer paper templates gives the edges crisp lines. 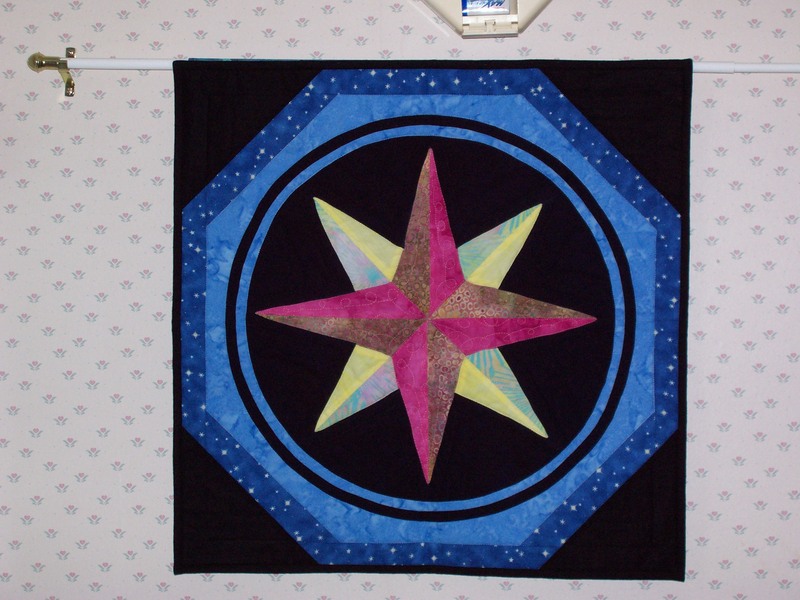 I was daring again and applied all the stitching to the star, then slit the back open to remove the freezer paper. The bird was stitched down in a similar fashion, but required different preparation with the inside curve along the bird’s back. The wing still needs stitched down, but will go quickly. These simple shapes are so fun & easy to applique. I really love these fabrics, too. I did some auditioning of the fabric to determine exactly where to position the star template and the bird wing template for cutting. Both are cut from the same fabric in a different colorway. I love how the center of the flower design gives definition to the shape. I sat down to my Bernina on Saturday afternoon and started FMQ. Again, I had done enough thinking about shapes and decided to just start stitching. Ultimately, I quilted designs I hadn’t even thought to quilt. I repeated the loops across the square sections like in the previous two blocks. Then, I began adding curves from one point to the next, followed by organic swirls and radiating lines. I looked for ways to quilt in a continuous line, creating some squiggles and stitch-in-the-ditch to move into the next corner section. Overall, I am satisfied with the quilting. I have found that my quilting is not steady and I often cross over patches or my lines are not straight or do not curve smoothly. I know that some of this is due to the shoulder surgery I had several years ago. Prior to that, my quilting was smoother. I am beginning to accept the changes I see occurring in my quilting and just begin finishing quilt tops. Some experienced quilters will likely state the mantra, it’ll get better the more you practice. Sorry, but I can only quilt in small sessions. The longer I quilt the more unsteady my movements. This square was all I could complete on Saturday. I am overcoming my obstacles to finishing projects. One of those obstacles has been perfection. 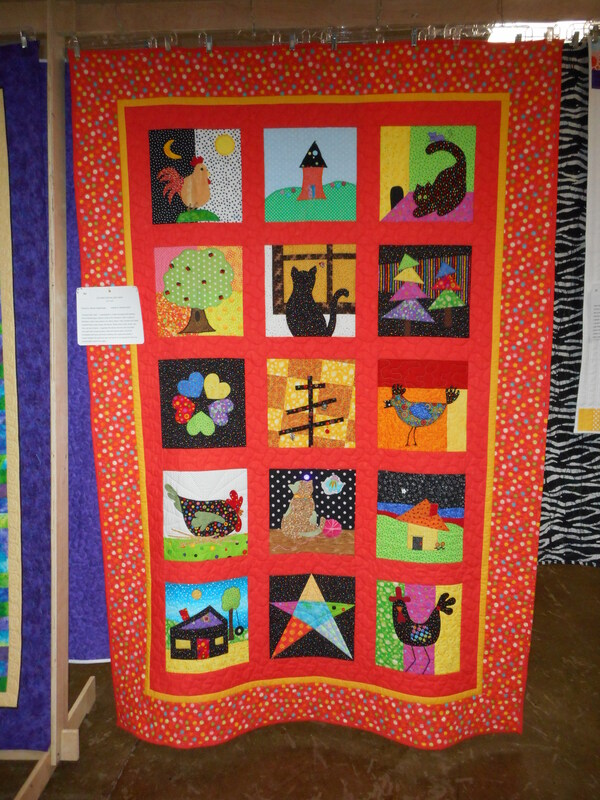 Have you seen some of those prize winning quilts? 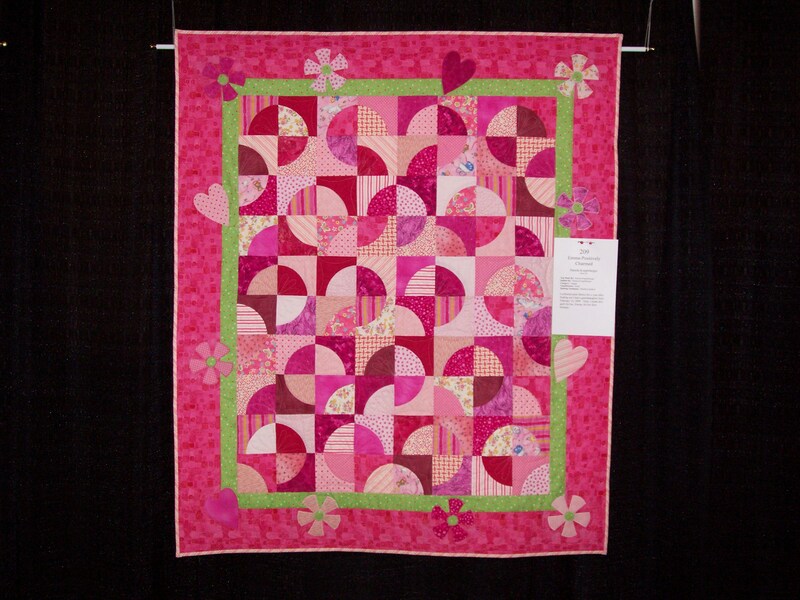 Check out this Judge’s Choice from AQS Paducah by Setsuko Matsushima of Japan. This is awesome! 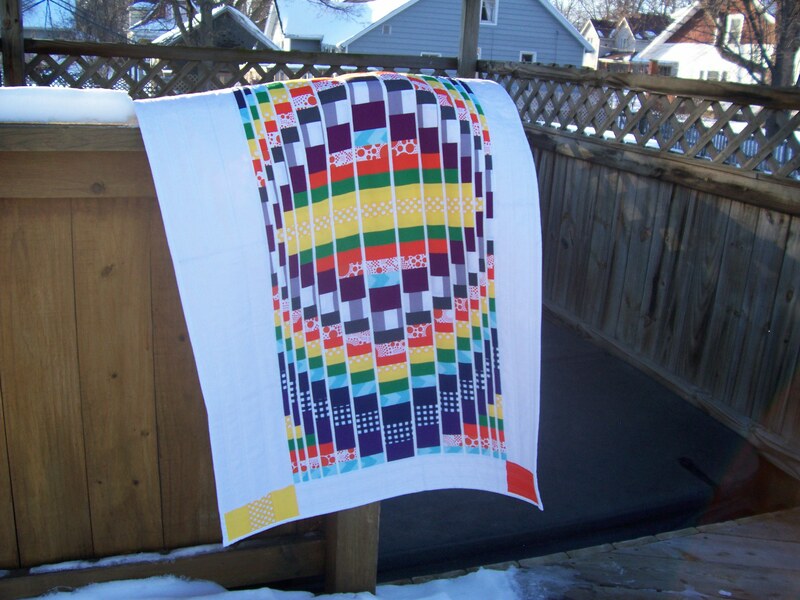 These quilts set the bar too high and leave amateurs like myself frustrated with my projects. When did quilting become so competitive? I want to enjoy my quilting again and that begins with accepting my work for what it is. I hope to pick up more of those long forgotten projects and finish them, as I continue to accept where I am at and the outcomes I achieve. They are uniquely me and that’s okay. What project did you work on last week-end? I’d love to hear about it. Until next week…keep on stitching! The weather has been nice, so I’ve spent time outdoors working in my flowerbeds. I cleaned up the dried stems & leaves from last year’s perennials and raked out the leftover leaves. I split up some hostas that have overgrown and transplanted iris rhizomes that were being crowded by black-eyed susans in the same bed. The heavy rains over the last three days should set the plants well. My tulips have bloomed and the peony plants are growing. What started as two lily of the valley plants some 15 years ago has spread through the back bed. May’s birth month flower will soon bloom. I transplanted a trumpet vine last fall and hope it takes root and sprouts leaves this spring. The rose bushes are sending out vines and needed trellises to control them. 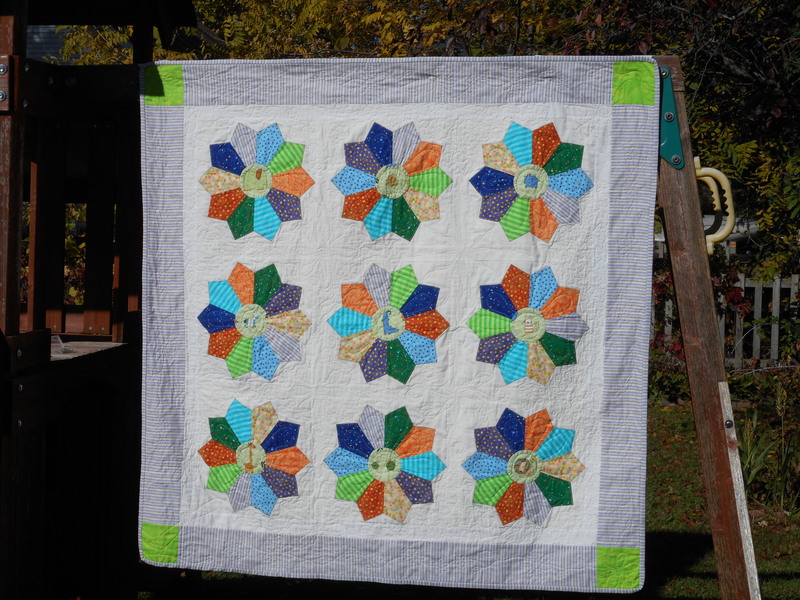 Flower gardens give much inspiration for quilters. The simple shapes & lovely colors offer a myriad of designs for applique. I continue to work on my Craftsy class project. I finished stitching the petals on an applique flower block and the butterfly block. Though my progress is slow, it continues weekly. Friday, my sister & I set out on a quilt Shop Hop. We travelled over 300 miles to visit four shops in mid-Michigan. We also checked out a new quilt shop that wasn’t on the hop. 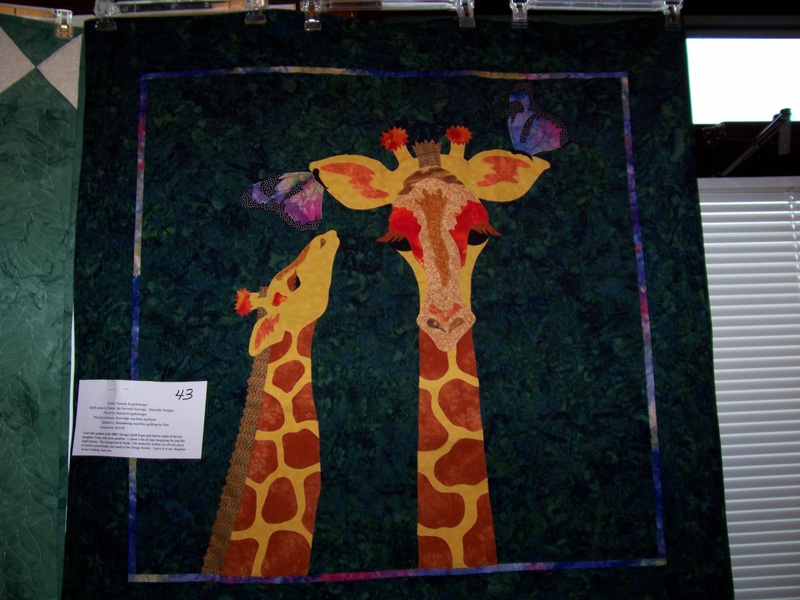 It turned out to be my favorite – Park Bench quilt shop in Midland, Michigan. I think the shop was well aware of the 3-day shop hop at their competitor down the street. They offered the same 20% discount on purchases. The fabrics are beautiful and the selection more the style that interests me. I picked up Joan Ford’s latest Scraptherapy book, The Versatile Nine Patch, along with several fat quarters to use in my elephant baby quilt I have yet to begin. I always take along a list of notions I would like to try. One in particular I looked for and found is the Kwik Klip. I have heard many rave about how well it helps with closing safety pins when pin basting. Got one and hope it lives up to the hype. The dreary weather kept me inside most of yesterday, so I also completed a bit of FMQ. I’ll have to share photos next time. Tomorrow, I am going on a field trip with my granddaughter to Woldumar Nature Center. All the rain has likely made the trails muddy and I’m praying the rain will hold off until the trip is over. That recaps some of the activities over the last two weeks. I’ve been busy with a lot more that keeps me away from needle & thread. But life is more than just quilting. Hoping to share more progress next week. Until then…happy stitching! Life has a way of getting in the way. Just when everything is running along smoothly, something comes along to mess up the routine. That’s when you just keep on living without worrying about life. You go with the flow. As they say in France, C‘est la vie! I realized early last week there wouldn’t be an opportunity to write a blog post. I also missed out on four days of Yoga with Adriene. My body was functioning with less sleep than usual. And, none of the things “getting in the way” had anything to do with quilting. 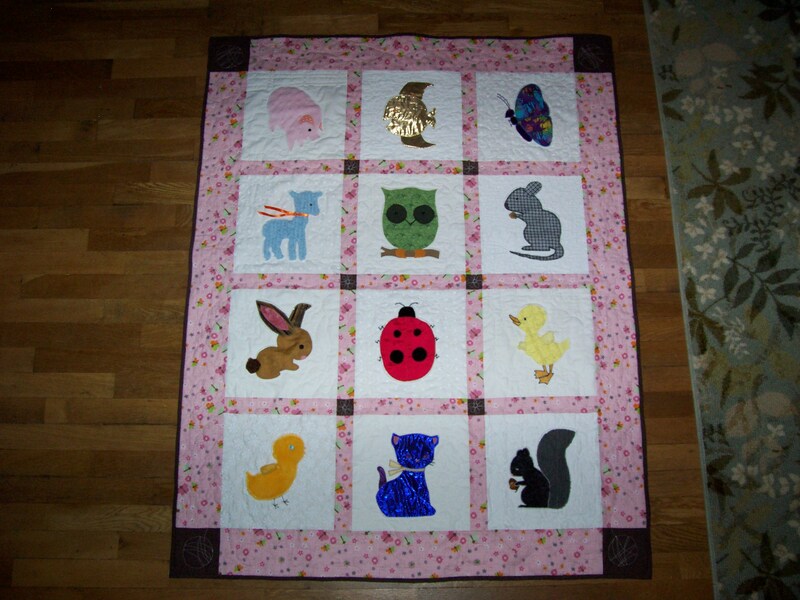 But, I am back writing this week, and I have some great photos to show of the FMQ I completed two weeks ago. I quilted the center embroidered blocks in the Sew Sweet Simplicity quilt. I started by echo quilting a line around the embroidery design, then filled in the remainder of the background area with stippling. Then, I quilted organic designs inside the embroidery motifs to evenly fill the block centers with quilting stitches. Here are photos of each block. I prefer to bury my threads, so I spent a couple of nights last week watching my new favorite series on Netflix, The Doctor Blake Mysteries, while knotting and pulling the thread ends into the quilt sandwich. The show is an Australian television drama that first aired 2/1/13. Set in the late 1950’s in Ballarat, Victoria, Australia, where Dr. Lucien Blake solves crimes. I recommend it to anyone that likes period dramas. 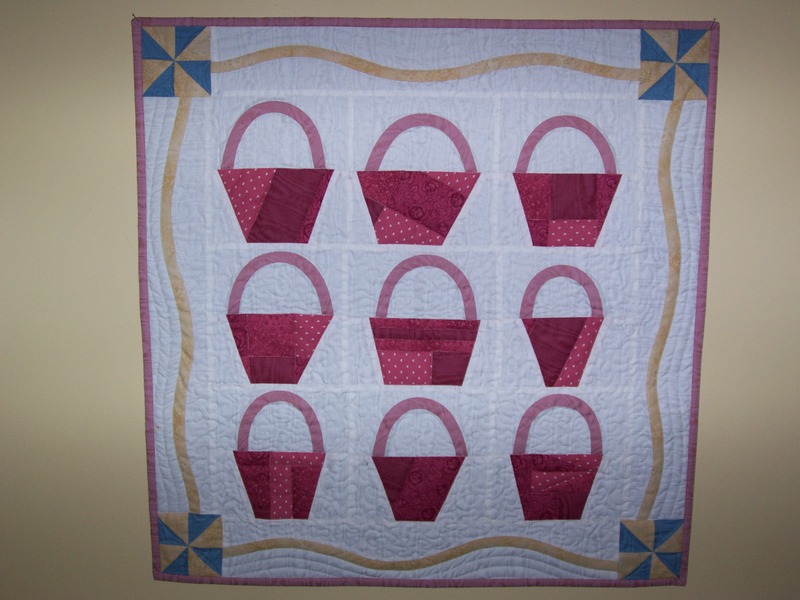 Here’s a look at the Sew Sweet Simplicity quilting to date. Still lots of quilting to accomplish, so no expectations of finishing in time to enter in the AQS GR show. There are other shows, so I will have to set a new deadline to keep me on track to finish this quilt. Progress: (noun) forward or onward movement toward a destination. Do you recall hearing about the 1933 World’s Fair in Chicago with the theme of Century of Progress? 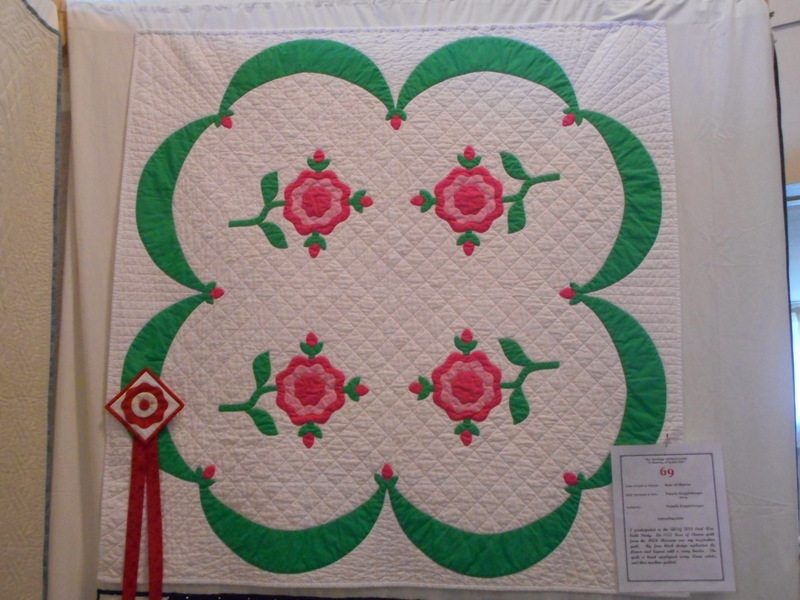 During the Great Depression, women from all over entered quilts into the largest contest ever held. 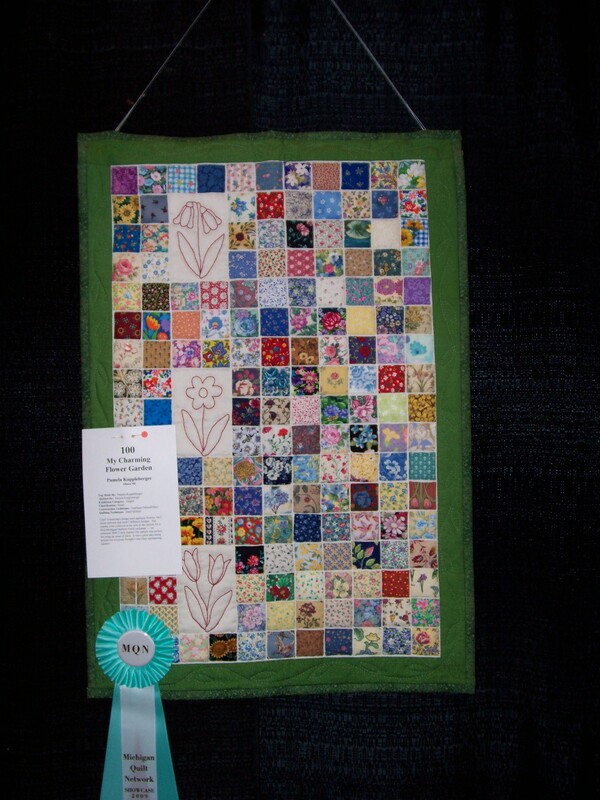 Fast forward to 2017 and women all over are entering quilts into contests. The competition is stiff. I recently received my AQ magazine with winners from the Daytona Beach QuiltWeek. 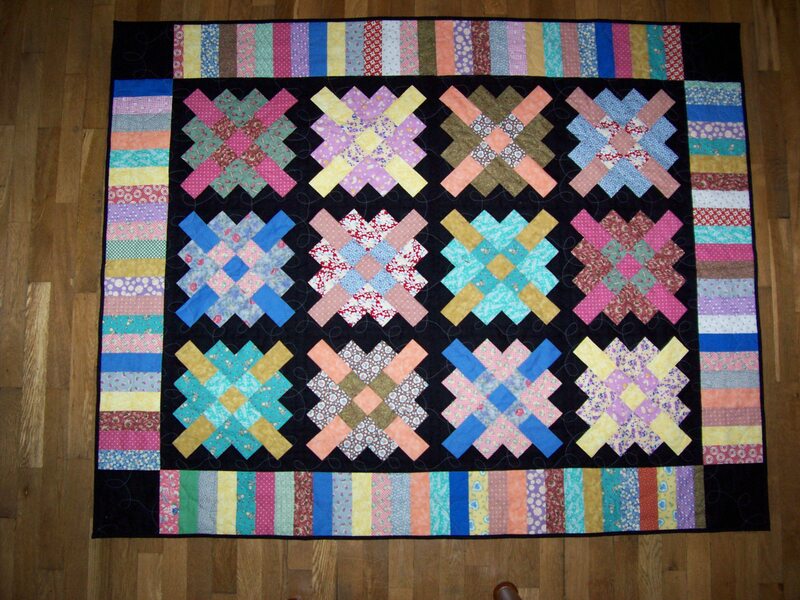 Fabulous quilts. The piecing, quilting, and artistry are just amazing. So, why would someone like me consider entering a quilt into such a contest? Not everyone will win and I hardly expect to take home a prize. But, there is just something about sharing quilts, at all levels. My progress towards entering a quilt into an AQS contest is slow, but I did begin the machine quilting, stitching in the ditch around the blocks. I will need to step up my quilting over the next two weeks, if I expect to finish in time to enter in the GR show. Here’s my quilting area setup. For those that read last week’s post on my Singer sewing machines, you may have wondered why I didn’t show a pic of my Bernina. Well, here it is. I purchased it in 2004, so it’s an older model. But, I love using it. Below are the blocks that I began stitching around. Not much to see. 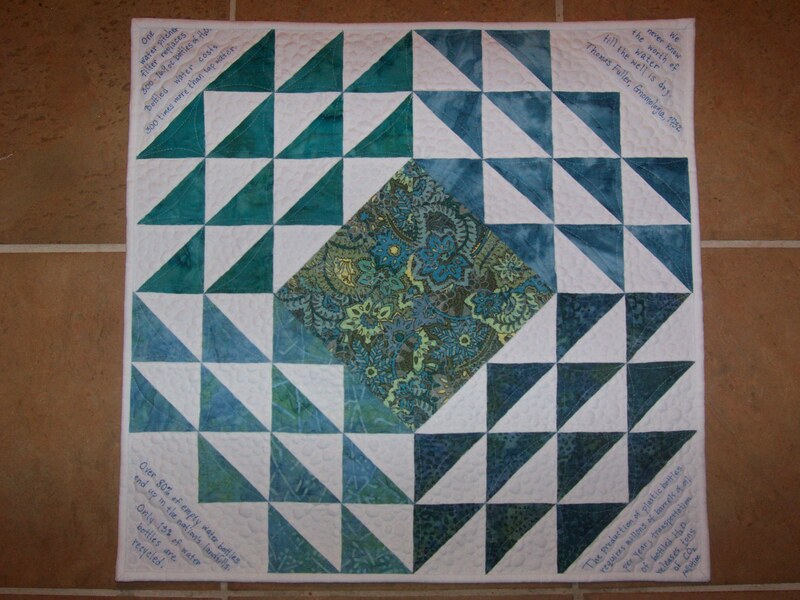 And, I continue to toss around ideas in my head about how to quilt the blocks. I also made progress on my applique project. I finished the Teacup block, pictured here with the only other finished block, Hearts. I love the teacup fabric and the coordinating orange heart fabric. These two fabrics, plus the large heart fabric, are from the Passport collection by Weeks Ringle over at Modern Quilt Studio. I picked up a fat quarter bundle from her booth at an AQS show. I finally decided to dip into the stash and use them in this quilt. So, I am moving forward toward my destination of finishing my quilts. I wonder sometimes, how our grandmothers found the time to make such fantastical hand stitched quilts, when I often find myself, with all the modern conveniences, unable to accomplish much of anything. Busy with a full time job, grandchildren, and church activities, I just wanted to sit this week out. I picked up a book to read and surfed through my social media sites. I do have a head cold, which may be impacting my choices. But, this week held little chance of accomplishing much stitching. I only prepared a few pieces for basting and took them on a weekend trip to keep occupied in the car. That’s the extent of my stitching. So, in order to entertain my readers, I am highlighting another favorite quilter topic: sewing machines. Who among us quilters doesn’t love to check out the latest machines or find antiques worth collecting. Although few in number, my collection is unique. All of my older machines are Singer brand. I grew up sewing on a Singer. When I got married, my husband purchased me a sewing machine for our first Christmas. It was a portable Singer that now sits inside a sewing machine cabinet; and my eldest granddaughter is learning to sew on it. My husband also purchased me a Singer Featherweight as a 25th anniversary gift. It’s a 1951 centennial edition. It stitches nice, but I haven’t used is so much. I learned to love sewing from my Grandma Smith. She sewed clothes and other things; some quilts. My Mom didn’t really have an interest, but my Grandma was very creative. She taught my older sister to knit and me to crochet. We both started 4H together and began sewing clothing. I still remember walking through the fabric section of Newberry’s, a local variety store, touching the fabric and dreaming what I would stitch. The Singer we used at home was an older machine that Grandma gave us to use, while she purchased herself a new one. Later, she purchased a Singer Athena 2000, the first electronic sewing machine on the market back in 1975. I acquired the Athena from my Grandma’s estate, along with the beautiful cabinet she purchased with the machine. Although I’ve only done a little bit of sewing on it, it has a lot of sentimental value. Several years ago, I came across a Singer treadle at a yard sale. I had to purchase it to round out my collection. It sits in a corner of the front room as an ornamental, conversation piece. I know a quilter that likes to refurbish antique machines and sew on them. I really have no interest in using the treadle. I may use the other sewing machines from time to time, but I would rather do my sewing on my Bernina virtuosa 155. I do everything on this machine, including free motion quilting. Could I afford it, I would upgrade to the latest version. 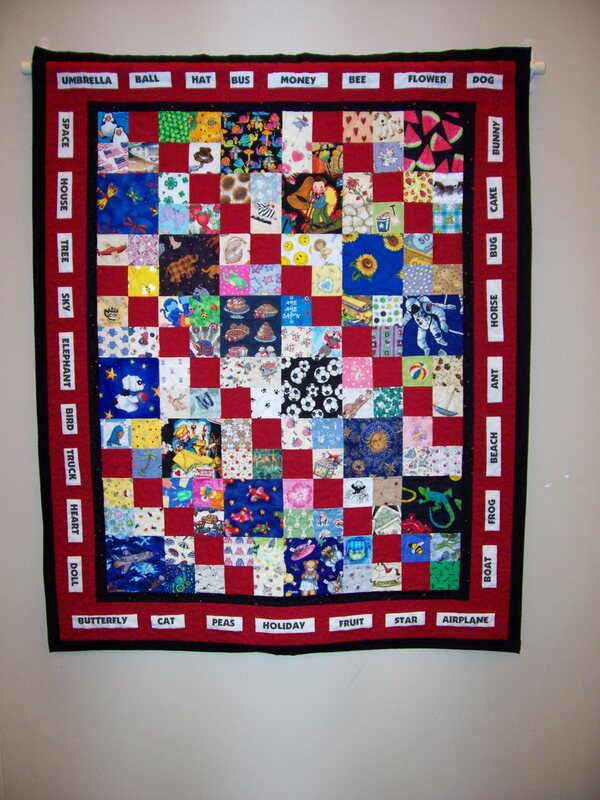 But, my wish list is to purchase a Handi Quilter Sweet Sixteen. Happy Stitching…on whatever sewing machine you own. I am a procrastinator. I put off doing things when I definitely have time. Last week, I procrastinated a lot. I definitely had time to work on a quilting project, but chose not to. I only found time to do yoga once during the week. And, I ate too many sweets. Maybe the change to daylights savings time affected me. For whatever reason, my week slipped by with little progress on any WIPs; no machine quilting on my Sew Sweet Simplicity quilt that I want to enter in a quilt show; and no hand quilting on the solids improv quilt that sets beside the sofa beckoning to me nightly. But, the week wasn’t a total failure. I had prepared some applique shapes for basting and took them along to my guild meeting. I was able to baste a few leaves. I fussy-cut some petal shapes. This project is from a hand applique class with teacher Mimi Dietrich over at Craftsy. I like that I can learn at my own pace, going back over the information as many times as I like. And, I can work on my project as I have the time. Mimi teaches several techniques, but I really like using freezer paper to back my applique shapes. I have used freezer paper in past projects, but Mimi adds some great tips to improve my applique. I appliqued the heart-shaped petals for the Heart Flower block on Sunday. I also prepared the petal shapes and the body for the butterfly block, which is now ready for stitching. 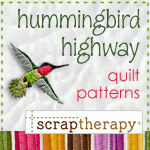 If you’re interested, check out the class at Craftsy, or any of the other classes, patterns, and supplies for purchase. There is always something free to download and some fun YouTube videos. 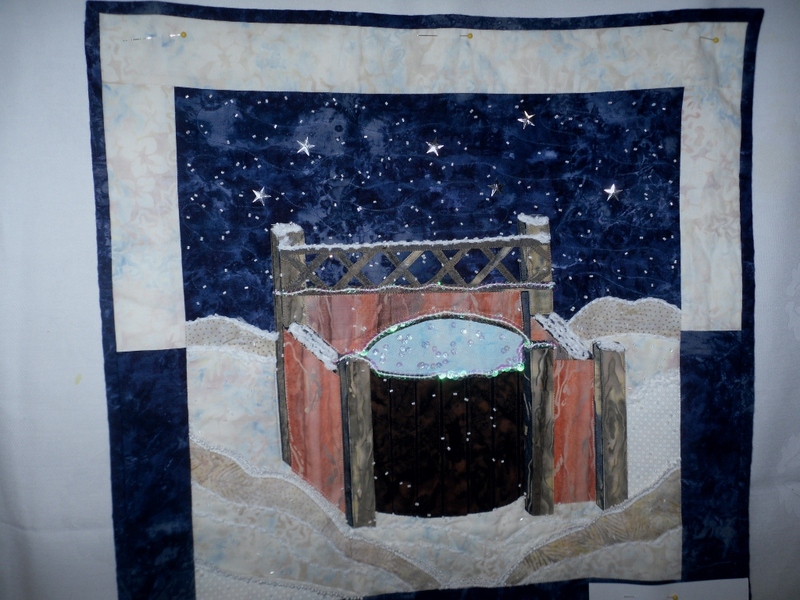 Have you seen The Midnight Quilt Show with Angela Walters? You really gotta watch! Angela is funny & creative. 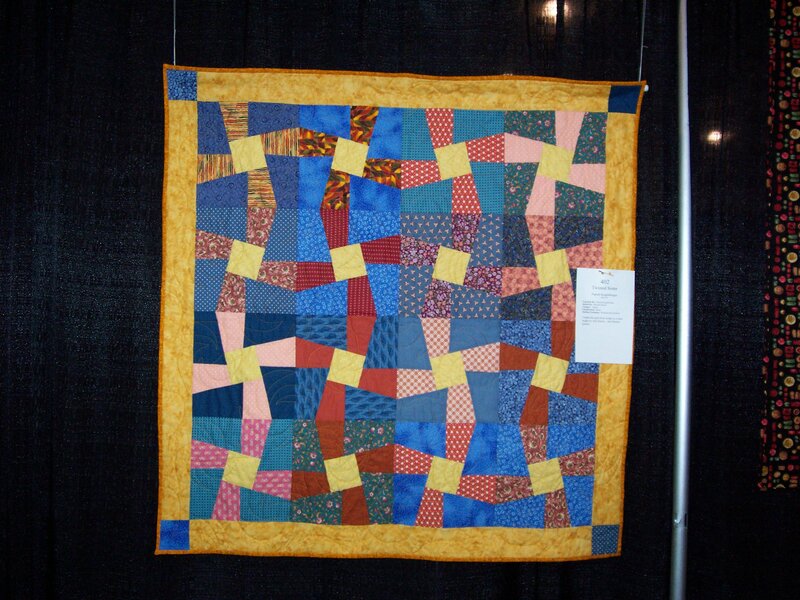 National Quilt Day was Saturday. Did you do something quilty? I had plans to attend a guild event, but they changed when my daughter organized a birthday party for my granddaughter. I did turn my blotto block in at the guild meeting, so that it would be a part of the giveaway. So, there’s the scoop for this week. Hope you’ve enjoyed doing something quilty. Until next time…Happy Stitching! I don’t know that my blog post meets all those definitions, but I am a day late in making my weekly post on my quilting project progress. Hopefully, when I am finished, you won’t agree that I am also “a dollar short”. A couple weeks ago, I mentioned attending a week-end event with my sister at my LQS. I purchased a package of double gauze fabric to make a swaddling blanket – a quick & easy project only requiring a rolled edge hem after trimming away the selvedges. The fabric in the package is printed with gray elephants and fits my youngest grandson’s room decor theme. I also stitched together a baby bib using a foam bib form and a fat quarter with tractors. The bib is for my other infant grandson who is beginning to eat pureed foods. The first photo shows the items when I purchased them, while the second has the finished projects. You may have noticed the picot edged bias tape in the first photo. This is a new product the LQS ordered at Market. I plan to make a second bib with one of the fabrics from my elephant walk quilt stash. I also spent time preparing some of the applique shapes for my Craftsy class project. Currently, I am preparing leaf shapes using freezer paper. Guild meeting is tomorrow night and I like to have a hand project to take along. I have more than enough to keep my hands occupied during the program. I continue considering machine quilting designs to use on my Sew Sweet Simplicity quilt. I enjoy browsing through the multitude of designs over at The Free Motion Quilting Project by Leah Day. This always sparks my imagination for machine quilting. I will likely use some swirls and some pebbles, since those are designs I enjoy quilting and have practiced a lot. 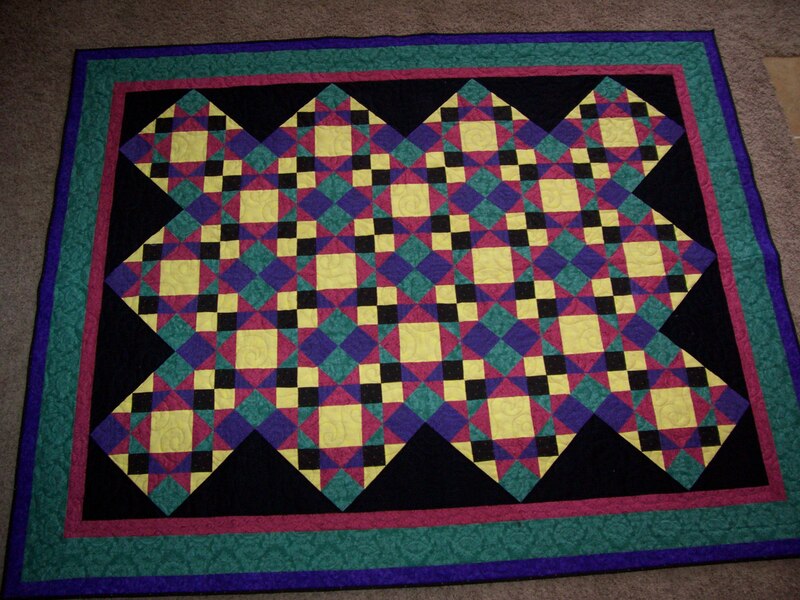 Are you working on a machine quilting project? What designs are you quilting? Seeing what you are working on may inspire me to make my decisions and get to the quilting. Learning a new craft is challenging. Teaching can also be challenging, trying to explain basic sewing principles in easy to understand terms. My granddaughter, Emma, has been a willing learner, but she exhibits frustration when she doesn’t do something right. When that happens, she needs a break and I allow for it. Today’s project was a small charm square pillow with a hand stitched initial. Emma has a keen sense of color. She spent quite a bit of time selecting fabrics from my stash, selecting fabrics that appealed to her and looked nice next to each other. Today’s lesson involved learning how to use rulers and a rotary cutter, including handling the cutter safely. We handled the rotary cutter together, knowing that she needs close supervision until she is more skilled. I also allowed Emma to practice her previously learned skills. She wound a bobbin, threaded the sewing machine, and stitched quarter-inch seams. She also learned a new skill: how to use a seam ripper. Interestingly, she realized during the sewing that she had veered out of the seamline. She stopped and immediately reached for the seam ripper to tear out part of the seam. No hesitation on her part to unsew and resew. That may be the perfectionist coming out in her. Emma completed the pillow project over the course of the day by taking breaks to do other things. At one point, I thought that she had stitched enough for the day, putting the project aside and shutting down the sewing machine. Later, I found Emma back in the sewing room hand stitching her initial onto the pillow top. It is exciting to see her developing an interest in handiwork. She’s already asking what our next project will be. I’m ready to teach her how to cut out a paper pattern and stitch together a piece of clothing. I made my first pair of pants in 4-H when I was 9 years old. My plan is a pair of flannel pajama pants. Emma is also learning to knit, from her other Grandma. Someday, she will realize how fortunate she is to have learned these skills as a child, since many of our young people are not learning them. If you’re a sewist, quilter, knitter, or embroider, pass that skill onto a younger person. We owe it to the next generation. This week has been very productive. 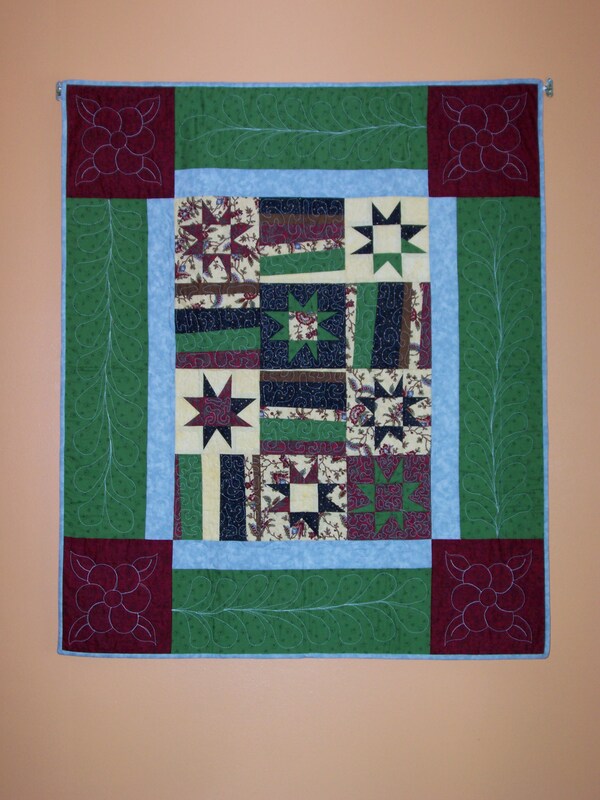 Early in the week I found time to hand quilt on the improvisational solids quilt. I appliqued a few more hearts on blocks for the Craftsy class project. The Sky Rocket blotto block is complete, although the dimensions are not accurate, but I am glad to have it done and will not fret over it’s imperfections. Saturday, I attended an event at my LQS with my sister. The shop held a Baby Gathering event and offered several ideas and patterns for baby items. Of course, as a grandma, I couldn’t walk away without purchasing a kit to make something for one of my new grandsons. But, my biggest accomplishment was basting my Sew Sweet Simplicity quilt top, a BOM by blogger Jacquelynne Steves over at The Art of Home. For smaller quilts, I like to pin baste on my wooden floor. I place the backing wrong side up on the floor and use painter’s tape to hold it in place. I make certain that the backing is smooth and taunt. Next, I add the batting. I opened a new package of Warm & Natural for this quilt top, placed it on top of the backing, then trimmed it even with the painter’s tape using regular scissors. Next, I folded the quilt top into quarters and centered it on top of the batting, unfolding it and smoothing it into place. The photos below show the flow of this process. Lastly, straddling the quilt, I place safety pins over the quilt top, every 3-5 inches around the blocks and along the borders. I decided to snap a photo of the quilt outside in the sunshine today. January was so dreary in Michigan, but the last couple of weeks have been wonderful. 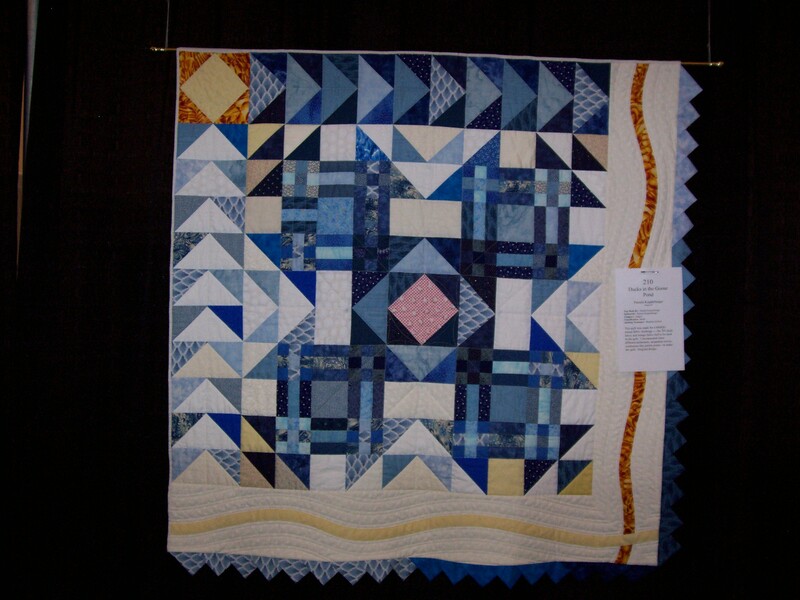 The natural light brightens the colors showcased in the quilt top. Now my quilt is ready to for machine quilting, which I’ll complete on my Bernina. 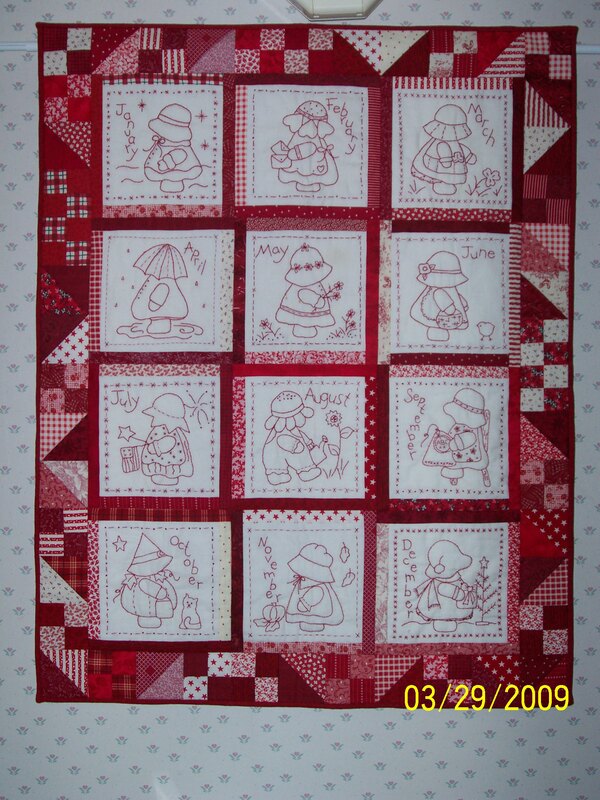 I am contemplating the designs I will use on the quilt to highlight the embroidery and fill the borders. 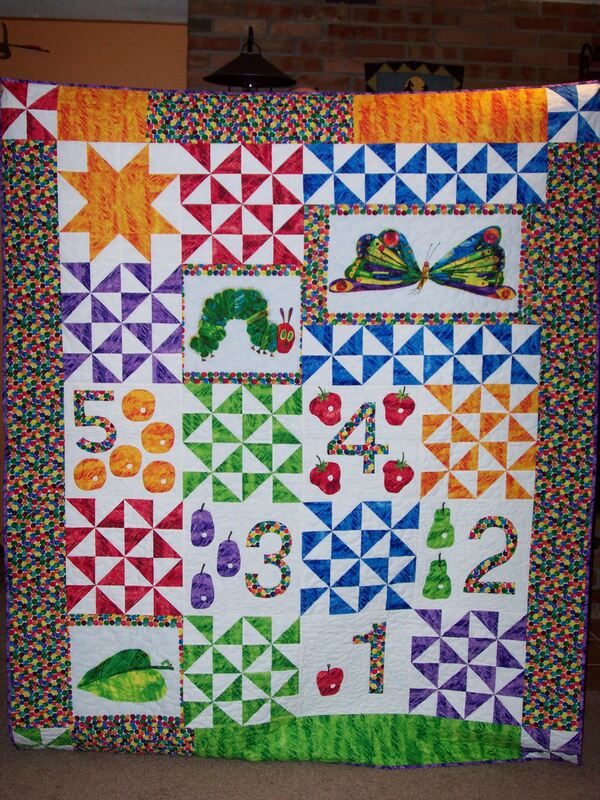 My goal for this quilt is a finish in time to send an entry into the AQS Grand Rapids quilt show, deadline April 21st, so I will be doing a lot of quilting over the next month. Well, that’s my weekly update showing progress on my quilting projects. Hopefully you have been able to find time for stitching, too. String Stars – Gwen Marston pattern. Fabrics used from a guild challenge. Free motion quilted. Emma, Positively Charmed – made for my granddaughter upon her birth. Challenge quilt made using Gwen Marston liberated quilting techniques.